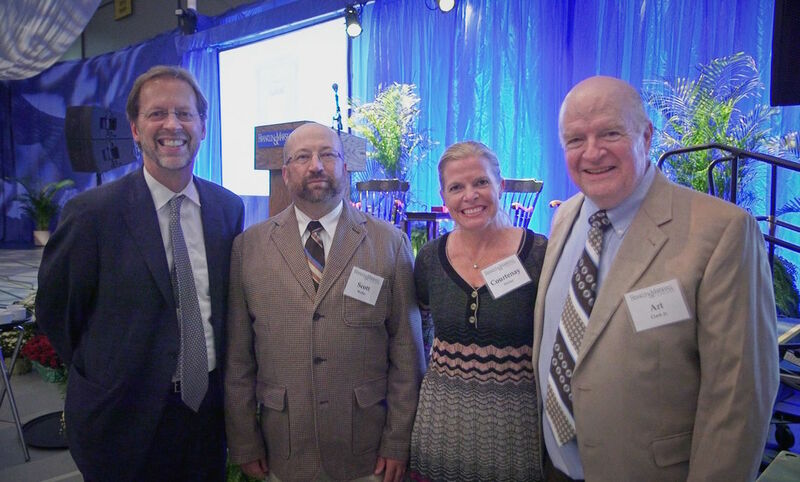 In his Aug. 31 address to the campus community launching the 2017-2018 academic year, Franklin & Marshall College President Dan Porterfield heralded the transformative philanthropic commitment of longtime F&M supporter Arthur “Art” Clark Jr. Clark’s most recent gifts, totaling $4.1 million, will provide substantial financial aid for high-achieving students attending the College. Through generous philanthropy over more than a decade, Clark has created powerful, endowed financial-aid resources at the College, assuring great opportunity for future F&M students and helping advance a critical institutional priority. His latest gift brings his total lifetime giving to F&M to $6.1 million and makes him the second-largest contributor of financial-aid-designated funding in the College’s history. Clark's father, Arthur R. Clark, Ph.D., was a 1934 graduate of F&M. The College stepped up to helped the young chemistry student when his father passed away during his sophomore year and it became impossible for the family to pay tuition. The elder Clark, who later earned master’s and doctoral degrees in chemistry from Penn State before founding the chemical manufacturing company Foxlyn, Inc., made a point of telling his son that without that assistance, his successes may not have been possible. Art Clark has been saying "thank you" to F&M through a series of gifts since shortly after his father's death in 2005. "My reason for giving back is what F&M did for my dad," said Clark. "My dad didn't have any recourse when he lost his father his sophomore year. F&M helped him through." Investment in financial aid has paid great dividends over many years—for students, the College and the world. The financial assistance the College lent Arthur Clark Sr., combined with a "foundation in chemistry and all-around education," eventually allowed him to launch his own business, added his son. At Foxlyn, Arthur Sr. would invent Pinolene, a polymer that significantly reduces agricultural pesticide loss from evaporation. "Increasing our resources for financial aid moves us ever closer to our long-term goal of being able to admit the most accomplished students without regard for their financial means, which is a hallmark of the strongest national institutions," said Porterfield. Fifty-seven percent of F&M’s incoming class received financial aid, a substantial increase over that total five years ago—35 percent. During that same period, the College has lowered the average indebtedness of graduating seniors by 15 percent. In Fiscal Year 2017, which ended June 30, donor support for financial aid totaled a record $14.4 million through a combination of gifts received and new pledges. "Financial aid helps us unlock more of the tremendous potential of young minds for creativity and innovation and entrepreneurship, creating enormous positive impacts for society — just as Art Clark's father, because of his experience at F&M, was able to develop his skills as a chemist and eventually invent a product greatly benefiting the nation's agricultural industry,” said Porterfield. Clark Sr.'s triumph in the laboratory meant that he could pay for all of Art's education, from prep school through his own graduation from Wesleyan University. "F&M is the reason that my father got his start, and that followed through to him educating me," said Clark, who after college and military service also worked at Foxlyn prior to the family selling the company in 1996. Clark focuses his philanthropy on providing educational opportunities for students by "giving back to the places that matter," including F&M. In 2007, he established the Arthur R. Clark, Ph.D., '34 and Margaret M. Clark Endowed Scholarship Fund to benefit students studying chemistry. He has subsequently provided gifts setting up a second fund honoring his parents, the Arthur R. Clark, Ph.D., '34 and Margaret M. Clark Financial Aid Endowed Fund, as well as the Arthur Randolph Clark, Jr., and Courtenay Marie Weller Family Endowed Scholarship Fund, recognizing his daughter and her family. A portion of Clark's latest commitments to the College will be allocated to the two funds named for his parents. The balance will go to the fund named for Art and Courtenay as well as three additional funds, each named for one of Courtenay's children.